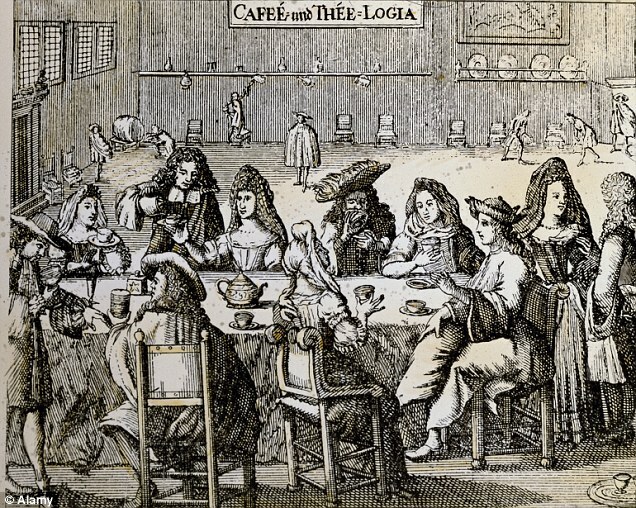 Although the Dutch also had early knowledge of coffee, there is no written evidence that the Dutch West India Company brought any of it to the first permanent settlement on Manhattan Island (1624). Nor is there any record of coffee in the cargo of the Mayflower (1620), although it included a wooden mortar & pestle, later used to make"coffee powder." The earliest reference to coffee in America is 1668, at which time a beverage made from the roasted beans, & flavored with sugar or honey, & cinnamon, was being drunk in New York. Coffee first appears in the official records of the New England colony in 1670. In 1683, the year following William Penn's settlement on the Delaware, he is buying supplies of coffee in the New York market & paying for them at the rate of 18 shillings & 9 pence per pound. Some researchers of New York's early days are confident that the1st coffee house in America was opened in New York; but the earliest authenticated record they have presented is that on November 1, 1696, John Hutchins bought a lot on Broadway, between Trinity churchyard & what is now Cedar Street, & there built a house he used as a coffee house,which would come to be calledKing's Arms. Later dubbed TheKing's Arms, this house was built of wood, & had a front of yellow brick, said to have been brought from Holland. TheKing's Armsbuilding was two stories high, & on the roof was an"observatory,"arranged with seats, & commanding a fine view of the bay, the river, & the city. Here theKing's Armscoffee-house visitors frequently sat in the afternoons. It stood for many years on Broadway, opposite Bowling Green, in the old De Lancey House, becoming known in 1763 as theKing's Arms, & later the Atlantic Garden House. The sides of the main room on the lower floor were lined with booths, which, for the sake of greater privacy, were screened with green curtains. There a patron could sip his coffee, or a more stimulating drink, meet with others to discuss news, or just relax & read his mail. The rooms on the second floor were used for special meetings of merchants, colonial magistrates & overseers, or similar public & private business. These meeting rooms seem to have been one of the chief features distinguishing a coffee house from a tavern. Although both types of houses had rooms for guests, & served meals, the coffee house was used for business purposes by permanent customers, while the tavern was patronized more by transients. Men met at the coffee house daily to carry on business, & went to the tavern for convivial purposes or lodgings. Before the front door hung the sign of"the lion & the unicorn fighting for the crown." For many years theKing's Armsseems to have been the only coffee house in New York City; or at least no other seems of sufficient importance to have been mentioned in colonial records. For this reason it wasfrequently designated as "the" coffee house. On September 22, 1709, the Journal of the General Assembly of the Colony of New York refers to a conference held in the "New Coffee House. "About this date the business section of the city had begun to drift eastward from Broadway to the waterfront; & from this fact it is assumed that the name "New Coffee House"indicates that the King's Arms may have been superseded in popularity by a newer coffee house. The Journal does not give the location of the "New" coffee house. Whatever the case may be, the name of the King's Arms does not again appear in the records until 1763, & then it had more the character of a tavern, or roadhouse. The Exchange Coffee Housei s thought to have been located at the foot of Broad Street, abutting the sea-wall & near the Long Bridge of that day. At that time this section was the business center of the city, & here was a trading exchange. The Exchange Coffee Housemay have been the only one of its kind in New York at the time. In 1732, an announcement of a meeting of the conference committee of the Council & Assembly "at the Coffee House." And an advertisement in 1733 in the New York Gazette requesting the return of "lost sleeve buttons to Mr. Todd, next door to the Coffee House." Robert Todd kept the famous Black Horse tavern which was located in this part of the city. Daniel Bloom, a mariner, in 1737 bought the Jamaica Pilot Boat tavern from John Dunks & named it theMerchants Coffee House. The building was situated on the northwest corner of the present Wall Street & Water (then Queen) Street; & Bloom was its landlord until his death, soon after the year 1750. He was succeeded by Captain James Ackland, who shortly sold it to Luke Roome. The latter disposed of the building in 1758 to Dr. Charles Arding. The doctor leased it to Mrs. Mary Ferrari, who continued as its proprietor until she moved, in 1772, to the newer building diagonally across the street on the southeast corner of Wall & Water Streets. Mrs. Ferrari took with her the patronage & the name of the Merchants Coffee House, & the old building was not used again as a coffee house. The original coffee house which was opened on the northwest corner of Wall & Water Streets about 1737, moved to the southeast corner in 1772. The building housing the original Merchants Coffee House was a two-story structure, with a balcony on the roof, which was typical of the middle 18C architecture in New York. On the first floor were the coffee bar & booths described in connection with the King's Arms coffee house. The2nd floor had the typical long room for public assembly. During Bloom's proprietorship the Merchants Coffee House had a long, hard struggle to win the patronage away from the Exchange Coffee House, which was flourishing at that time. But, being located near the Meal Market, where the merchants were wont to gather for trading purposes, it gradually became the meeting place of the city, at the expense of the Exchange coffee house, farther down the waterfront. Widow Ferrari presided over the original Merchants Coffee House for 14 years, until she moved across the street. She was a keen business woman. Just before she was ready to open the new coffee house she announced to her old patrons that she would give a house-warming, at which arrack, punch, wine, cold ham, tongue, & other delicacies of the day would be served. The event was duly noted in the newspapers, one stating that "the agreeable situation & the elegance of the new house had occasioned a great resort of company to it." Mrs. Ferrari continued in charge until May 1, 1776, when Cornelius Bradford became proprietor & sought to build up the patronage, which had dwindled somewhat during the stirring days immediately preceding the Revolution. In his announcement of the change of ownership, he said, "Interesting intelligence will be carefully collected & the greatest attention will be given to the arrival of vessels, when trade & navigation shall resume their former channels." He referred to the complete embargo of trade to Europe which the colonists were enduring. When the American troops withdrew from the city during the Revolution, Bradford went also, to Rhinebeck on the Hudson. During the British occupation, the Merchants Coffee House was a place of great activity. As before, it was the center of trading, & under the British régime it became also the place where the prize ships were sold. The Chamber of Commerce resumed its sessions in the upper long room in 1779, having been suspended since 1775. The Chamber paid fifty pounds rent per annum for the use of the room to Mrs. Smith, the landlady at the time. In 1781, John Stachan, then proprietor of the Queen's Head tavern, became landlord of the Merchants Coffee House, & he promised in a public announcement "to pay attention not only as a Coffee House, but as a tavern, in the truest; & to distinguish the same as the City Tavern & Coffee House, with constant & best attendance. Breakfast from seven to eleven; soups & relishes from eleven to half-past one. Tea, coffee, etc., in the afternoon, as in England." But when he began charging sixpence for receiving & dispatching letters by man-o'-war to England, he brought a storm about his ears, & was forced to give up the practise. He continued in charge until peace came, & Cornelius Bradford came with it to resume proprietorship of theMerchants Coffee House. Bradford attempted to change the name to the New York Coffee House, but the public continued to call it by its original name, & the landlord soon gave in. He kept a marine list, giving the names of vessels arriving & departing, recording their ports of sailing. He also opened a register of returning citizens, "where any gentleman now resident in the city," his advertisement stated,"may insert their names & place of residence. "This seems to have been the first attempt at a city directory. By his energy Bradford soon made the Merchants Coffee House again the business center of the city. When he died, in 1786, he was mourned as one of the leading citizens. His funeral was held at the coffee house over which he had presided so well. The Merchants Coffee House continued to be the principal public gathering place until it was destroyed by fire in 1804. During its existence it had figured prominently in many of the local & national historic events: the reading of the order to the citizens, in 1765, warning them to stop rioting against the Stamp Act; the debates on the subject of not accepting consignments of goods from Great Britain; the general meeting of citizens on May 19, 1774, suggesting a congress of deputies from the colonies & calling for a "virtuous & spirited Union;" the mass meeting of citizens following the battles at Concord & Lexington in Massachusetts; & the forming of the Committee of One Hundred to administer the public business. The Merchants coffee house was the site 1784, where the Bank of New York was formed, the first financial institution in the city. In 1790, the 1st public sale of stocks by sworn brokers was held there. When the American Army held the city in 1776, the Merchants Coffee House became the resort of army & navy officers. On April 23, 1789, when Washington, the recently elected first president of the United States, was officially greeted at the coffee house by the governor of the State, the mayor of the city, & the lesser municipal officers. The Whitehall Coffee House, was opened briefly by 2 gentlemen, named Rogers & Humphreys, in 1762, with the announcement that "a correspondence is settled in London & Bristol to remit by every opportunity all the public prints & pamphlets as soon as published; & there will be a weekly supply of New York, Boston & other American newspapers." The early records of the city occasionally mention the "Burns Coffee House," sometimes calling it a tavern. It is likely that the place was more an inn & tavern than a coffee house. It was kept for a number of years by George Burns, near the Battery, & was located in the historic old De Lancey house, which afterward became the City hotel. Burns remained the proprietor until 1762, when it was taken over by a Mrs. Steele. Edward Barden became the landlord in 1768. In later years it became known as the Atlantic Garden House. Traitor Benedict Arnold is said to have lodged in the old tavern after deserting to the enemy. 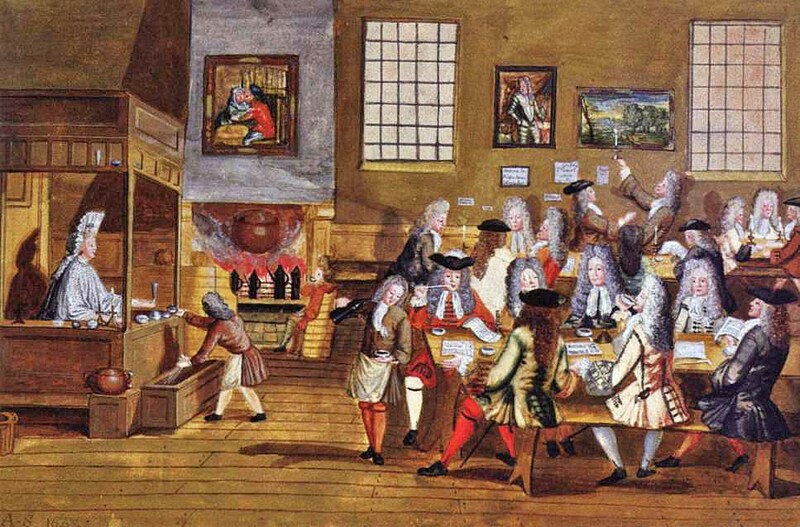 In 1791, 50 merchants organized the Tontine Coffee House. This enterprise was based on the plan introduced into France in 1653 by Lorenzo Tonti, with slight variations. According to the New York Tontine plan, each holder's share reverted automatically to the surviving shareholders in the association, instead of to his heirs. There were 157 original shareholders, & 203 shares of stock valued at £200 each. The directors bought the house & lot on the northwest corner of Wall & Water Streets, where the original Merchants Coffee House stood. 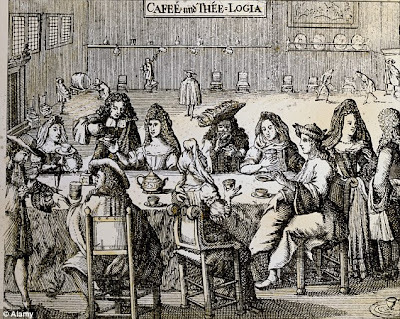 The cornerstone of the new Tontine Coffee House was laid June 5, 1792; & a year later to the day, 120 gentlemen sat down to a banquet in the completed coffee house to celebrate the event of the year before. The Tontine Coffee House had cost $43,000. A contemporary account of the Tontine Coffee Housei n 1794 is supplied by an Englishman visiting New York at the time: "The Tontine tavern & coffee house is a handsome large brick building; you ascend six or eight steps under a portico, into a large public room, which is the Stock Exchange of New York, where all bargains are made. Here are two books kept, as at Lloyd's [in London] of every ship's arrival & clearance. This house was built for the accommodation of the merchants by Tontine shares of two hundred pounds each. It is kept by Mr. Hyde, formerly a woolen draper in London. You can lodge & board there at a common table, & you pay ten shillings currency a day, whether you dine out or not."